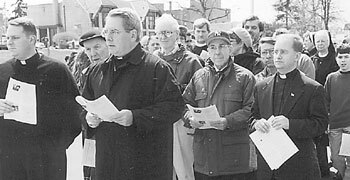 Archbishop John J. Myers led the Stations of the Cross for Life in Englewood. Participants walked in procession past a clinic that performs abortions while praying the rosary. In our last post we discussed Archbishop Raymond Burke and a pontifical appointment he and Archbishop John Myers received. Today we will feature a few quotes from Archbishop Myers who was Bishop of Peoria, IL from 1987-2001 and has been Archbishop of Newark, NJ since 2001. A FUTURE POST WILL INCLUDE QUOTES FROM ARCHBISHOP MYERS’ 2004 WALL STREET JOURNAL ARTICLE titled “A Voter’s Guide“.